U.S. Army officer Carlos Cervantes arrived in Iraq in January 2005. When he deploye­d, Carlos left behind his 7-months-pregnant wife Kristine and his 2-year-old son Andrew. The Cervantes, more than many families, appre­ciate how precious family time is. Eleven years later, now living in Cicero, they spend crisp fall days on football fields together. 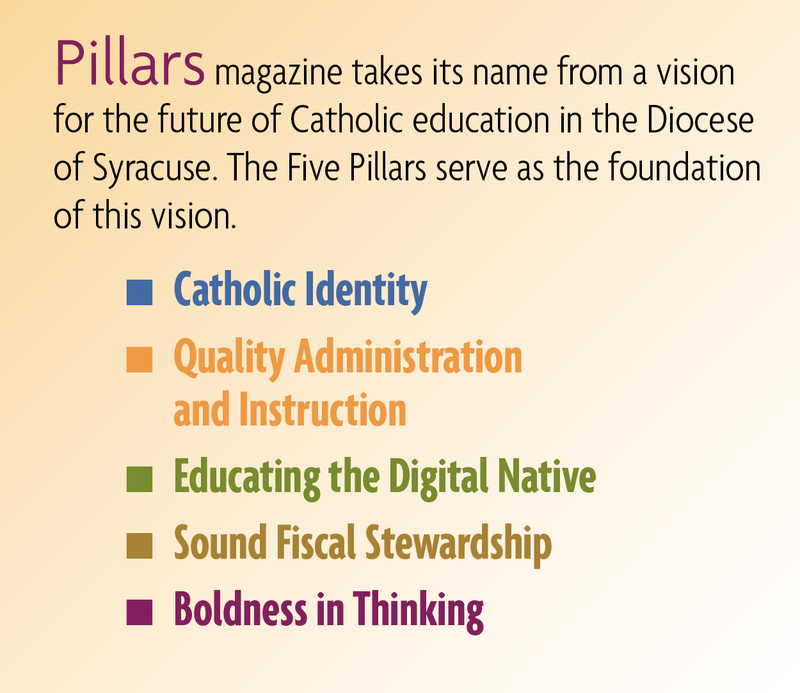 They now have three boys who all attend Syracuse-area Catholic schools. They, more than most, know that service to their country means some lonely stretches when family members are thousands of miles apart, and how critical a sense of community can be during those times. They came from opposite ends of the country; Carlos from the tough streets of Los Angeles and Kristine from Connecticut. They met at Fort Lewis in Tacoma, Washington, and later served together in South Korea. Carlos’ mother emigrated to the U.S. from Guat­e­mala. Despite her struggle to work a factory job and feed her family, she found the funds to send him to a Catholic school. He went on to attend a local college until bad luck struck. His car was stolen, and, without a way to get to classes, he had to drop out. The military legacy in Kristine’s family is a long one, including her grandfather’s service in World Wars I and II and her father’s service as a Marine commander in Vietnam. Kristine and her sister both became Army officers. Like other couples who share career fields, the Cervantes knew well what their service required and the potential for separation when someone was deployed to a war zone. Kristine retired from the Army in 2002, just after 9/11 and before the major deployments began to Iraq and Afghanistan. In 2005, they were living in North Carolina, where Carlos served at Fort Bragg. He missed their second son’s birth by just three months, after was deployed to Iraq. In 2008, the family moved to New York. Carlos became commander of the military entrance pro­cessing station at Hancock Air Force Base. Before moving north, Kristine researched nearby schools for their oldest, Andrew, to attend. They enrolled him at St. Margaret’s School in Mattydale sight unseen from North Carolina. Their two younger sons, Evan and Thomas, are now sixth and fourth graders at St. Margaret’s. The school provided them with the sense of community they hoped to find, and it ultimately clinched their decision to settle long-term in the Syracuse area. After his 2005-06 Iraq tour of duty, Carlos’ next deployment came up quickly. In January 2007, he was deployed to Afghanistan. His commander allowed him to stay back in Central New York until their third son, Thomas, was born, but he shipped out 10 days after. Their oldest was 4, their middle son just about a year old. That wartime service stint led to more years of family separation. After his return, Carlos attended military-funded graduate school in Rhode Island. During that year, he returned to Syracuse on week­ends. But as soon as he graduated in June 2012, he was sent to Texas, from where he returned to Afghanistan as an Afghan Army advisor. Although Kristine’s parents had moved to Central New York and lent their support, having their dad far away became harder for their sons. “The hardest deployment was his most recent one, when the boys were getting older and I felt like they needed their father more,” said Kristine. Andrew, now a ninth grader at Bishop Ludden Jr./Sr. High School, was only in 5th grade when he made a promise to his father. “I had to kind of be like the man of the house because that’s what he told me to do while he was gone. So I had to take on a lot more responsibility,” Andrew said. Carlos retired as a lieutenant colonel and is now the director of student services at State University of New York’s Educational Opportunity Center. Kristine is a physical therapist and also teaches occupational therapy students at Le Moyne College. 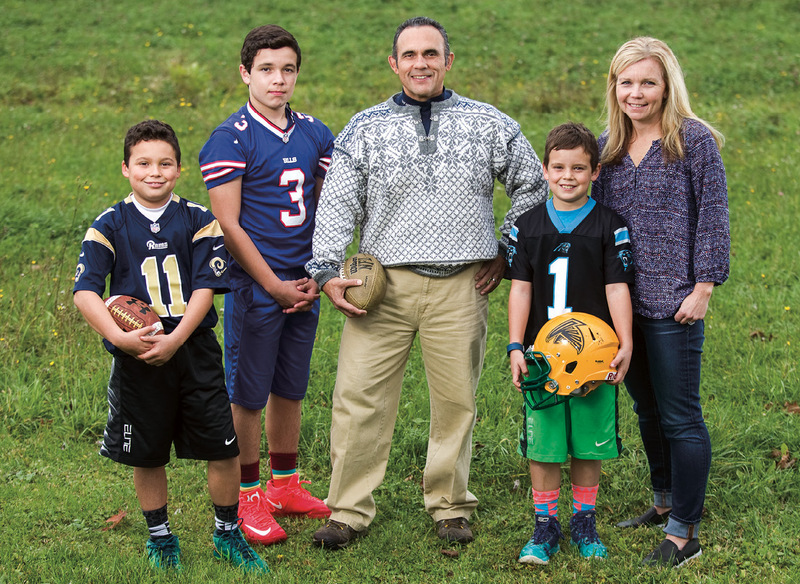 Andrew is a running back on Bishop Ludden’s football team. Christy Perry Tuohey is an author and freelance writer in Syracuse, New York.